"Ice Crusher" stainless-steel blade for ice, frozen fruit and other frozen foods. All-Metal Drive system for extra durability. Oster 12-Speed Blender quickly disassembles for easy cleanup. Convenient cord-storage feature, you don't have to wind the power cord around the body. Price $30 Based on the manufacturer's suggested retail price (MSRP), this blender is LESS EXPENSIVE THAN AVERAGE and is priced in the BOTTOM 3% of all blenders. 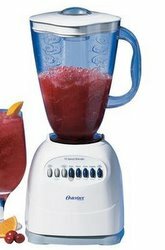 Stars Based on actual user experience and reviews, this blender is RATED LOWER THAN AVERAGE by 34 USERS and ranks in the BOTTOM 20% of all blenders. 47% of users rate this blender favorably. Love it. What can I say. I am enjoying my blender very much. It is perfect for all my needs. Bought this blender new. Used it about 12 times before the motor burned up. I know its an inexpensive blender but it should have been good for at least a couple of hundred runs. I bought this blender 5 days ago, used it 3 times and it broke! NEVER again will I buy CHEAP home appliances. Oster has now replaced the bottom screw cap of the jar with the flimsiest piece of plastic I have ever seen. I could literally break it into pieces with one hand. We are a young family with 2 kids and have used this blender at least 3 times a week for around 10 years.